Peri-operative experience of parents whose children undergo cardiac surgery: are we delivering? Exploring the experiences of parents with a child undergoing cardiac surgery during the pre-operative and peri-operative phases. Having a child who requires heart surgery is a complex and stressful experience for families (Harvey et al 2013, Re et al 2013, Kosta et al 2015). The experience of families is high on the agenda of the NHS and is included in the Congenital Heart Disease Review Standards and Specifications (NHS England 2015). We aimed to explore the lived experience of parents with a child undergoing a cardiac surgical procedure during the pre-operative and peri-operative phases. A descriptive phenomenological approach (Moule and Goodman 2014) helped to identify themes that described the lived experience. The study was undertaken in a UK tertiary children’s cardiac centre, where approximately 250-300 children a year undergo elective cardiac surgery. About 20-25 children and their parents were expected to meet the study criteria. Purposive sampling was used, with an inclusion criteria of parents from all ethnic backgrounds (English speaking), mothers and/or fathers, children of all ages and children admitted from their home environment who required elective open heart surgery. In summer 2015, 24 invitation letters were sent 2-4 weeks before admission to parents of children being admitted for surgery. Post-operatively, 11 parents were approached, once their child was stable. Thirteen were excluded for logistical reasons, such as the timing of surgery. One mother did not wish to relive the experience, but ten mothers agreed to be interviewed. Three were discharged at a weekend when the researcher was not available, so seven mothers were interviewed. Interviews were unstructured but aimed to answer: what is the lived experience and what do parents perceive their support needs to be during the pre and peri-operative periods? Interviews lasted between 30 and 60 minutes and were conducted away from the ward before discharge. They were audiotaped, transcribed verbatim, double checked, coded and stored in an electronic file. A phenomenological analysis tool (Colaizzi 1978) was used to analyse the data. Four dominant themes were identified from the analysis: remaining the parent, the emotional rollercoaster, breathing space and support. The main finding was that while there were similarities in the experiences and emotions described by the mothers, essentially it was a unique experience with a variety of coping strategies deployed. All mothers shared thoughts, frustrations and anxieties relating to the admission process. Sharing stories was described as being therapeutically beneficial, helping some parents to move on. Healthcare professionals need to recognise the differing support needs parents require at this time to provide individualised, family-centred care. 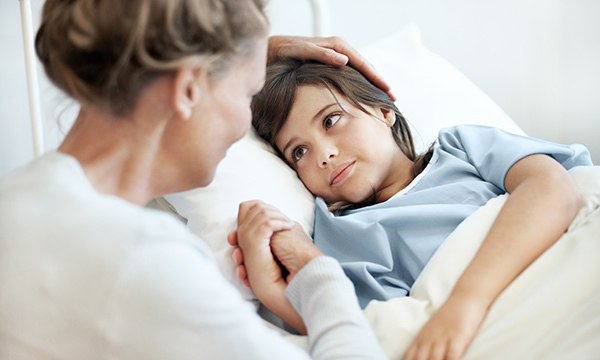 Offering all families an opportunity to share their feelings before discharge could be beneficial; however, educational preparation of healthcare professionals would need to be considered in deciding who should undertake this role. Further research should explore parents’ experiences throughout the admission process, including parents of children requiring emergency surgery, to assess whether their support needs differ. Undertaking the study was an enlightening and valuable learning experience for the novice researcher, discovering the nuances of conducting a research project and its challenges, such as the length of time to gain ethical approval, academic deadlines, and the practicalities of interviewing and transcribing. A pilot interview proved beneficial for the researcher as it provided an opportunity to deal with technical and environmental issues. More time for recruitment may have resulted in additional participants, including fathers, as would an interpreter for non-English speaking families. Ethical approval was gained from the University of Wolverhampton and the local research ethics committee. Harvey KA, Kovalesky A, Woods RK et al (2013) Experiences of mothers of infants with congenital heart disease before, during, and after complex cardiac surgery. Heart Lung. 42, 6 399-406. Kosta L et al (2015) Parental experiences of their infant’s hospitalization for cardiac surgery. Child: Care, Health and Development. 41, 6,1057-1065. Moule P, Goodman M (2014) Nursing Research: An Introduction. Second edition. Sage, London. Re J, Dean S, Menahem S (2013) Infant cardiac surgery: mothers tell their story. World Journal for Pediatric & Congenital Heart Surgery. 4, 3, 278-285. Karen Byrne is an advanced nurse practitioner, cardiac unit, Birmingham Children’s Hospital. For, and on behalf of, RCNs Research in Child Health community.